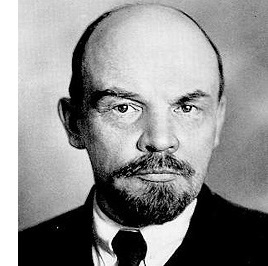 Vladimir Lenin (1870-1924) - The man who rose to power in Russia after the Russian Revolution and put Karl Marx's ideas into practice. As a result, his name is often coupled with Marx to describe the ideology as Marxist-Leninist. Lenin's interest in Marx's ideas appears to have been spurred by his older brother, Aleksandr, who was executed in 1887 for an assassination attempt on Tsar Alexander III (Nicolas' father). In the 1890s he got a law degree and joined the Russian Social Democratic Labour Party (RSDLP). For his activities, Lenin was exiled to Siberia for three years (from 1897 to 1900) by Russian authorities. The RSDLP is the party which split between the Bolsheviks and Mensheviks in the early 20th-century. Lenin became a leading figure amongst the Bolsheviks. His Menshevik counterpart was Julius Martov. The two differed in their approach toward representation within the party. Martov argued that everyone should have a voice so long as they belonged to the party. Lenin wanted tighter control, favoring that decision-making be placed within a smaller body of individuals. The debate would continue for more than a decade until it was finally settled in the October Revolution. When his exile ended, Lenin moved to St. Petersburg for a while, but felt it would be safer to leave Russia altogether beyond the Czar's reach. While living in Western Europe, he published a paper called Iskra (The Spark) which was smuggled into Russia. It became the most widely read underground newspaper in the country. Lenin returned to Russia briefly and was present for the 1905 Revolution. He tried to stir up revolt, but the Bolsheviks were still too small and too weak to overcome the Czar's army. Fearing reprisal, he fled once again to Western Europe, eventually settling in Switzerland. When the February Revolution broke out, he made immediate plans to return to Russia in hopes of capitalizing on the unrest. With the help of the German government, he was transported across the country and returned in April 1917. Germany hoped the chaos would cause Russia to drop out of the First World War, which it eventually did. Lenin went to work trying to overthrow the Provisional Government which was established after the abdication of Czar Nicholas II (see Russian Revolution). He composed his April Theses as an outline for how the Bolsheviks would rule should they seize power. And in the October Revolution, they did just that. American socialist journalist, John Reed, was in St. Petersburg at the time and recorded the events. He wrote that when Lenin entered the chamber where the Bolsheviks had gathered, the first words out of his mouth, after applause for him subsided were: "We shall now proceed to construct the Socialist order!" One of his first decrees was to nationalize all land, business and wealth, and bring it under state control. This included all church property as well. Up to 8,000 clergymen were killed for refusing to comply with this order. Lenin became the most powerful man in Russia, which would be renamed the Union of Soviet Socialist Republics (USSR) or Soviet Union. His time in power was short, however, having died of a stroke in 1924. Josef Stalin (1879-1953) - By most accounts, Leon Trotsky probably should have succeeded Valdimir Lenin as leader of the Soviet Union. He was Lenin's right-hand man and as much responsible for the overthrow of the Provisional Government as anyone. However, Josef Stalin was also a prominent figure in the Bolshevik Party, and ruthless in his ambition for power. Furthermore, in 1922 Lenin and Trotsky had a falling out, and in retaliation, Lenin threw his support behind Stalin appointing him General Secretary. This placed Stalin in a position of strength. And shortly after, Lenin suffered his first stroke, forcing him from public life. As general secretary, Stalin frequently visited Lenin to keep him apprised of the party's work. It was during these meetings that Lenin came to distrust Stalin. He saw in Stalin a raw thirst for power which made Lenin uneasy. 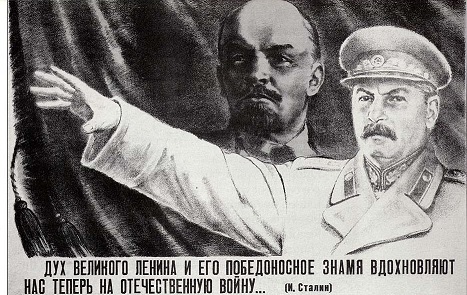 Before his death, Lenin stated in his testament that Stalin should be replaced as general secretary. However, because he was semi-incapacitated, Stalin was able to prevent Lenin's written testament from becoming public immediately following his death. Instead a power-struggle ensued upon Lenin's death. Stalin skillfully used his allies to retain his position, and then once he had secured power, just as quickly turned on them. He was extremely paranoid and took no chances, eliminating anyone he thought was a threat. Two of his most infamous legacies were his Great Purge and the establishment of the Gulag in the 1930s, wherein millions of Russians lost their lives. Although his number one rival, Leon Trotsky, survived the purges and fled the Soviet Union, he was later assassinated in Mexico on Stalin's orders. As leader of the Soviet Union, he instituted a policy of forced industrialization in an attempt to close the technology gap with Western Europe. When World War II broke out, most of those involved were expecting a titanic clash between Stalin and Hitler; two men who hated each other and who both wanted to rule as much of the world as possible. To everyone's surprise, they signed a non-aggression pact (formally known as the Molotov-Ribbentrop Pact) on August 23, 1939. From a strategic standpoint, it made sense for both sides to enter into the agreement. Hitler did not want to fight a two-front war as Germany had in World War I, and Stalin was loathe to face the German war machine prematurely. Of course, Hitler famously broke the pact two years later. Stalin emerged victorious and remained in power another eight years after the war. In that time, he closed the scientific gap with the United States by developing atomic weapons in 1949 (most likely stealing the technology from the US). Stalin is often considered the second most evil man of the 20th-century right behind Hitler, which is ironic because he was actually responsible for about twice as many deaths as Hitler (roughly 20 million). The reason he comes in second is most likely due to the fact that he did not instigate World War II as Hitler had. He also was not as charismatic as Hitler and many of his atrocities did not come out until years after his death.